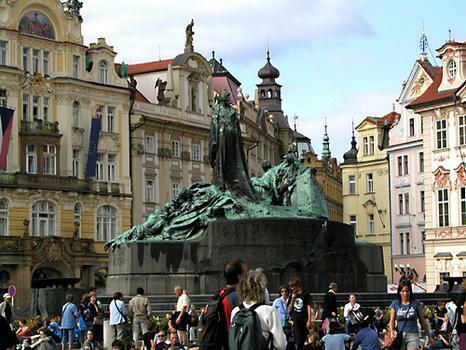 That striking man standing atop a patina-green metal mountain in the center of Old Town Square is not Jesus, though he resembles him. That striking man standing atop a patina-green metal mountain in the center of Old Town Square is not Jesus, though he resembles him. It's Jan Hus, the great Czech religious reformer whose Hussite movement caused as much, if not more, friction within the Christian community as Martin Luther. The statue was erected on the 500th anniversary of his death (6 July 1915). Hus preached in the Bethlehem Church in Old Town and was himself not particularly radical, unlike some of the sects who followed him. He believed in Bibles written in the worshiper's language, in the importance of faith instead of a clergyman's intermediation with God - in other words, concepts which threatened the status quo. He was summoned to the Church's Council of Constance in Switzerland by representatives of the Emperor, and given a letter of safe conduct to get there and back. Like every member of the Habsburg family, before and after him, the Emperor was Catholic. After Hus refused to repent for his so-called sins and come back into the Church, he was burned at the stake, despite the promise of the Emperor.